Would You Buy A Haunted Doll? I can’t imagine adopting a haunted doll. I was at my favorite antique mall a few weeks ago with some friends and I witnessed something I won’t soon forget. We were looking around and when Barbara and Amy went to look at dolls, I followed them. I immediately experienced an overwhelming feeling of sadness came over me. It reminded me of the feeling others experienced with the famous Mandy doll. Amy was drawn to one particular doll that was in a locked display case. Barbara went into the next booth and was looking around. I found something across from them and was browsing for a few minutes. Then I glanced back at the booth where Amy was waiting for someone to open the display case. The doll had shifted position and had turned to look at the booth where I was standing. I have to admit it made me feel uncomfortable, but it was worth experimenting. What did I have to fear? The doll was locked up. I joined Amy and was looking around at other dolls in other cases and some that were out. After a few minutes of browsing, I looked back at “Amy’s doll” and once again she changed position, looking straight at me. I asked Amy if she was aware that the doll moved, but she hadn’t noticed. So, I had Amy move around as I had earlier. I joined Barbara during this experiment so I wouldn’t distract the doll or Amy. To Amy’s disappointment, the doll didn’t move. I shared her disappointment. Amy really wanted this doll and had every intention of buying it. Now I don’t know if the doll knew this and was waiting until Amy took it home to move around or what. Amy was having second thoughts, thinking the doll wanted me to buy it, but I told her I had no intention of buying any dolls. I do have dolls, but I’m not planning to add to my collection. By the time someone finally came with the key to unlock the cabinet, the doll again shifted position. This time she had raised her right arm in a gesture of waving. She did seem happy to see the woman with the key or delighted that the cabinet was being opened. Amy saw this change in the doll. Again, I thought back to the Mandy doll. I had no idea what the doll was thinking at the time, but the look on her face wasn’t happy. I was curious what she was going to do. Amy did pick up the doll and examined her closely. Instead of making any statement about the doll’s condition and an offer, Amy handed the doll to the woman, thanked her and walked away to another booth. I wanted to ask Amy why she didn’t buy the doll, but I knew Amy would talk about it when she was ready to do so. At lunch, Barbara blunting asked why Amy didn’t buy the doll after waiting so long. Amy shrugged and said, “It didn’t feel right. It was warm to the touch and when I was examining it . . .” she paused and showed us the inside of her left hand. I almost choked on the sip of water I had just taken. Well, I had to agree with Amy. I wouldn’t want a doll that would bite me and I wouldn’t want a doll that was obviously haunted. On the latter point, Amy and I disagreed. She was looking forward to having a haunted doll. I suppose I won’t be smudging any dolls for Amy in the future. There are definitely many people who want to adopt haunted dolls. That’s fine for them as long as they know what they’re buying. I haven’t seen any good come out of it, but there are always exceptions. For those of you unfamiliar with the story of this doll named Mandy, I’ll briefly share it with you. Mandy is a porcelain doll dating back to either 1910 or 1920. 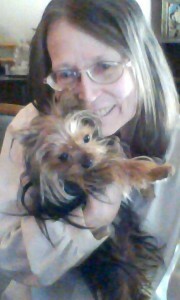 She was made in either Germany or England. In 1991 she was donated to the Quesnel Museum in British Columbia by a woman who would hear a baby crying in the basement of her home. When she would go to investigate, she would find a window open, but no baby. There is a story or legend going around in an effort to explain how the doll became “possessed.” As the story goes, a little girl and the doll were trapped in a basement. The little girl died and her spirit became trapped within the doll. Several years after this incident, the doll was found in the basement when someone went to investigate a child crying. To make this a memorable story, it is said that when the doll was found, it was crying tears of blood. This latter statement was never proven, nor repeated, so it’s what it is. . . true to those who witnessed it and questionable to those who didn’t. When Mandy first arrived at Quesnel Museum she was placed in the foyer to greet visitors. Later she was placed in a case located in another part of the museum. Many visitors have reported feeling sad or uncomfortable around her. Others have observed that her eyes blink and her fingers and head move. Well, there you have it. 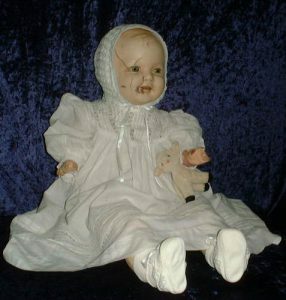 Mandy is a haunted doll and is now residing comfortably at Quesnel Museum in British Columbia. I really don’t know what to make of the “haunted doll” at the antique mall. Why on earth would it bite Amy? Did it want me to hold it . . . and buy it? Or would it have bitten me as well? I sometimes wonder about antiques . . . do we really choose them . . . or do they choose us? Let me know your thoughts in the comments below. 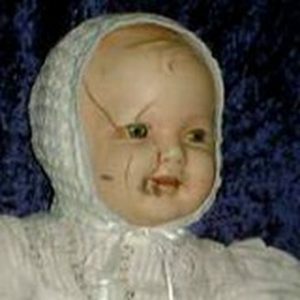 I would love to hear your experiences with haunted dolls . . . or your real ghost stories.